I finally figured out what to do with the package of nail wheels I bought.. I normally buy a few new (to me) nail polishes every month.. Sometimes I mention them, sometimes I don't. What I am really good at, however, is hiding them in my 'to try' drawer and totally forgetting about them..
Today, while out and about, I happened to stop in at Winners.. And right in the 'beauty' section was a set of Color Club polishes (the Pardon My French collection) - I have never seen them available there (although I have heard of them being around from time to time..) so I immediately snapped them up.. Even though I wasn't a HUGE fan of the shades. There was also a trio of e.l.f brand polishes.. I hummed and hawed over them, but ultimately ended up purchasing them. 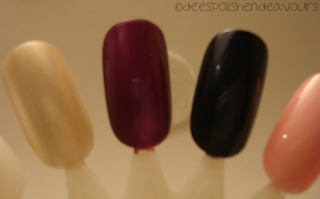 Now, after being home and putting a swipe (or three) of the polish on the nail wheel.. I am extremely happy with my purchases. Now on to the photos.. 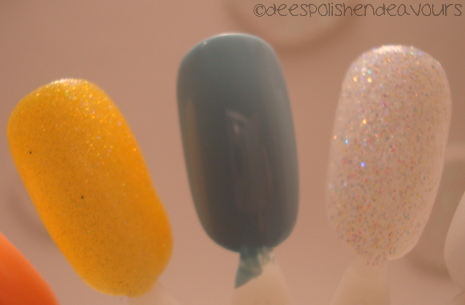 The pretty CC polishes.. There is: Pardon My French, I Believe In Amour, Hot Couture, Oh Naturale, Turn The Other Chic, Take Me To Your Chateau and Si Vous Please. 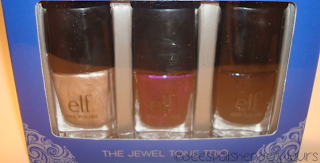 The e.l.f polishes.. They are: Moonlight, Royal Purple and Dark Navy. Also, I for some reason, took horrid photos of the wheel, so cut-off there is CC Pardon My French. Shown here is CC I Believe In Amour, Hot Couture and Oh Naturale. Shown here is CC Turn The Other Chic, Take Me To Your Chateau and Si Vous Please. And this is what I am currently sporting. It is CG Sea Spray. I knew I would probably be racing around running errands AND I really hate running around with naked nails.. I didn't do any designs/nail art because I knew I would probably be painting later.. But I do really like this colour and want to add a little something to it.. What should I do!? Now time to address comments as I haven't done that in awhile. Sorry for the lack of nail art in this post.. I will try to get something else up by the end of the week - I promise!! theVEROblog - Thank you, it actually bothered me to have to remove it.. I really liked the orderly mess of it! jaljen - Thank you, thank you, thank you! Steffie - Thank you.. I also like them.. A nice subtle approach.. Although I cannot complain about rainbow-in-your-face cheetah print either.. Hmm..
Vixxan - I do too!! 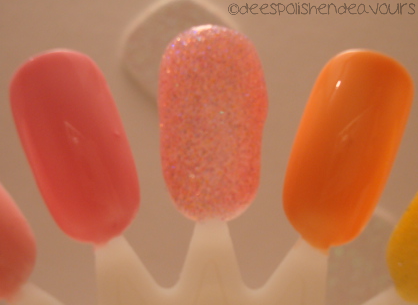 shortwidenails - Bah! I knew I was forgetting a photo of something in this post! I will definitely snap a photo of it.. I actually really hated the pen at first.. But after playing around with it (and remembering to go over the design a few times for coverage) I kind of like the pen. I should get it in white as well! They have a wealth of different colours available! Loving the Color Club collection! Oh my gosh Dee... I love the Hot Couture pink glitter polish. So cute! I only do solids because I'm too lazy and impatient to have my nails dry. At least if I reck it I can redo it because it's only one colour.